It's nice. Really conveys sasuke's feeling XD well done. I love it! *o* Sasuke is my favorite character *o*! I love very much your wall! It represents very well Sasuke :)! Good job! 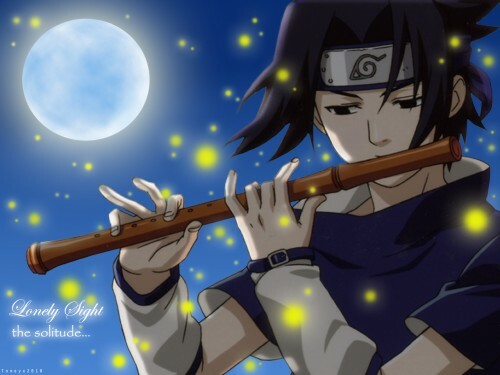 Wow..Sasuke playing the flute..I bet he's really good at that. yay its sasuke! and his playing the flute! cool! wow ... sasuke really looks like he's torn in between of something .. what a feeling exudes in the wallpaper! Very nice wally!It remind me Tayuya from (Naruto) the sound ninja! Really nice! Well done I love it to bits! P.S:my name means that Anko and Kakashi make a good cuple. Mwah... It does convey some of his loneliness. ^^ The golden lights (fireflies?) were a nice touch, as well. You got what you wanted, even quiet he always looks kinda sad and lonely T_T poor Sasuke... great job! Sasuke-kun! my bishie! so kute! were did you get the scan its so beautiful! sasuke playing flute...AWESOME!thanks for uploading!